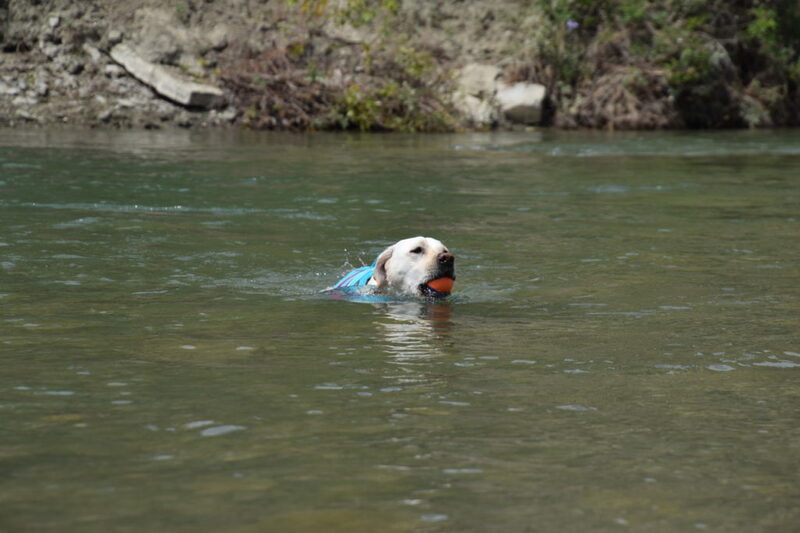 Farley enjoys swimming and has become quite confident in her skills. 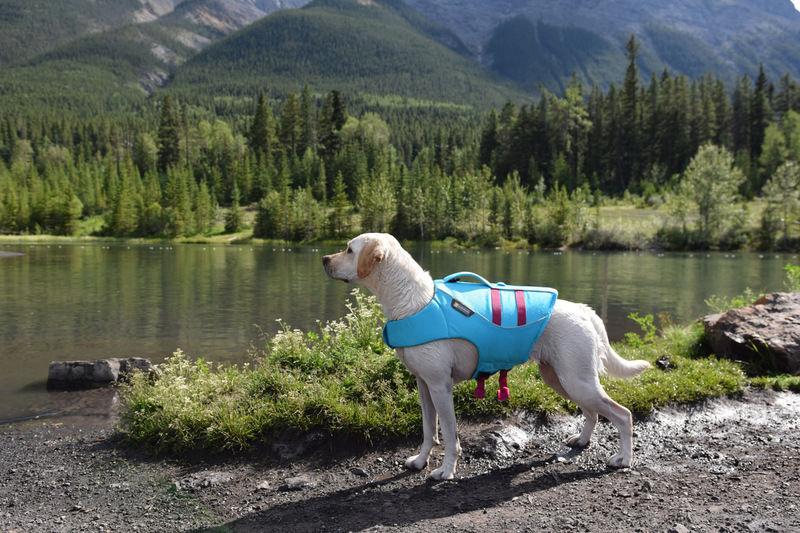 Despite Farley being a strong swimmer, we often adventure near glacier water, which means a life jacket is necessary to ensure her safety. The main purpose of a life jacket is to keep your dog afloat and providing a handle that is strong enough to lift your dog to safety. We were given the opportunity to test the Ruffwear Float Coat. Farley was right in between the small and medium size dimensions so we did size up to a medium. 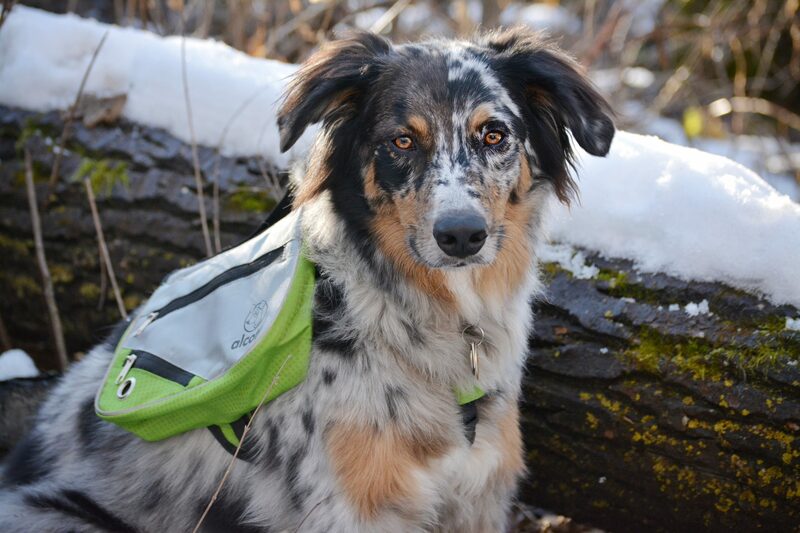 While Ruffwear recommends sizing down if between sizes, we looked at the Float Coat’s expanded size guide and figured the 15” back length of the medium would be more appropriate for Farley’s 20” back. We are happy we made this decision as the size small would have been too snug and too short on Farley and likely wouldn’t have provided enough buoyancy for her weight. The Float Coat is offered in 6 different sizes for girths ranging from 13” to 42” meaning there are options for most dogs. The life jacket comes in three high visibility colour options, allowing owners to choose one that suits their dog best. The colour choices and design does make the Float Coat more aesthetically appealing than other life jackets on the market. We tested the life jacket in cold-water lakes in the Rocky Mountains and in a river with a moderate current. The Float Coat is advertised for floatation and water safety and boasts a sturdy handle to lift dogs out of the water. When choosing a life jacket, the most important features are the lift handle and buoyancy. The float coat has two foam panels on the back and thinner foam under the belly and neck for floatation. We initially thought that only having two panels would create an awkward fit but the foam and neoprene was thin enough to fit snug against Farley’s body shape. While swimming, you could see the life jacket trying to pull Farley to the surface of the water. It did lift her head and part of her upper body partially out of the water, although her hind end did stay mostly submerged. The jacket definitely helped while she was tiring at the end of her swim, but we are unsure if it would keep her body afloat if she were to stop swimming entirely. Considering the life jacket provides a nice fit without being bulky, it did a good job at providing buoyancy while she was swimming. 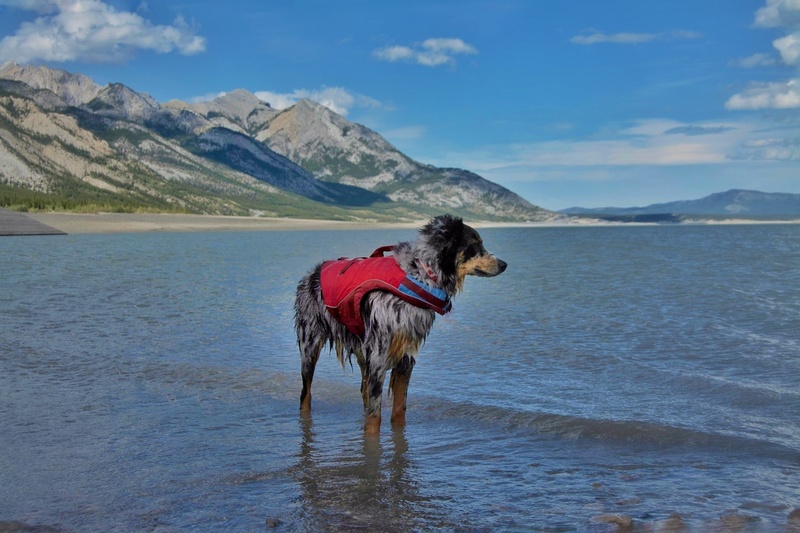 It is important to note that the Float Coat, like most dog life jackets, is not advertised as a life saving device and therefore cannot be expected to save a dog, but instead provide flotation assistance. The Float Coat is made of durable fabric that held up great while Farley was running amongst the trees and playing with other dogs by the river. 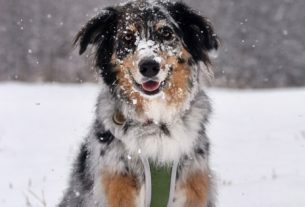 Despite brushing up against branches and other dogs grabbing the coat, there were no snags or signs of wear. The lift and assist handle is one of the most secure handles that we’ve seen on a dog life jacket due to it being built into the jacket instead of being sewn onto the foam panels. The handle is thick and sturdy and very easy to grab in a hurry. It is positioned at the top of the lifejacket where most of the dog’s body weight is positioned. While lifting Farley, the handle position helped keep her body level and prevented the coat from riding up or shifting. The thickness and size of the handle made lifting a 55lbs dog quite easy and comfortable. Due to having the Blue Atoll colour, it does show mud quite easily. We followed Ruffwear’s recommended washing instructions on a gentle wash cycle and the life jacket came out looking brand new. It is important to ensure the coat dries well after washing, as we did note that the telescopic neckpiece did stay wet inside while the rest of the jacket was dry. While Farley was right between sizes, the medium fit her perfectly. It was able to cinch small enough to properly fit her chest girth and appeared to be an appropriate length. The neck strap is greatly designed by offering a telescoping neck to eliminate hanging straps and minimizing bulk. The plastic buckles are all tucked away neatly under the fabric shelter and appear to be quite strong. The nylon chest straps have built in Velcro strips, allowing the nylon straps to be rolled and secured to prevent them from dangling. Eliminating hanging straps is one of the minor details that provide a great purpose and is one of our favourite features. There is also a leash attachment point, although it is located underneath the handle, making the positioning slightly awkward. Ruffwear has added a small loop directly behind the handle that is designed to attach one of their waterproof lights for added visibility. There are also two reflective piping strips on each side of the life jacket. While these do not provide significant nighttime reflection, this was not a priority for us, as we would rarely be swimming after the sun starts to set. During the daytime, the vibrant colour of the life jacket itself met our visibility needs. 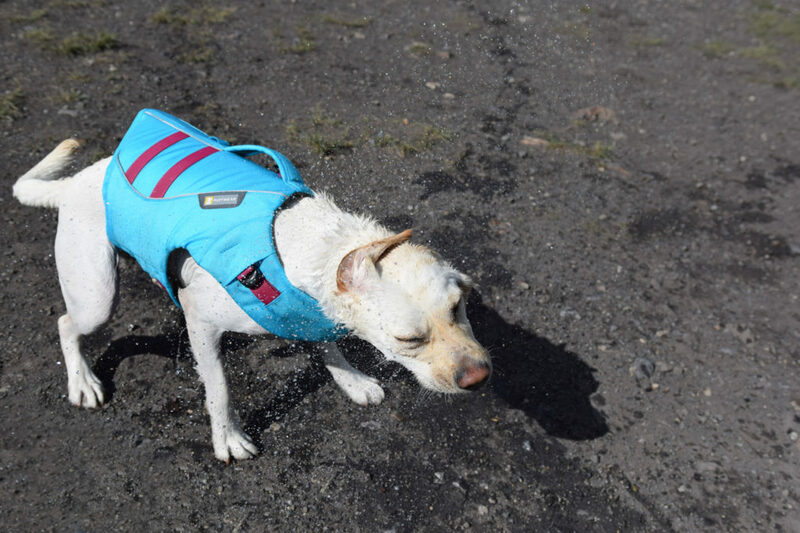 Overall the Ruffwear Float Coat is a great option for those looking for a life jacket to assist their dog while swimming and having a reliable way to lift their dog out of the water. It did hold up to the advertised function of providing buoyancy and a secure handle for lifting assistance. It provides a non-bulky design that is perfect for safe water conditions and for most dogs. 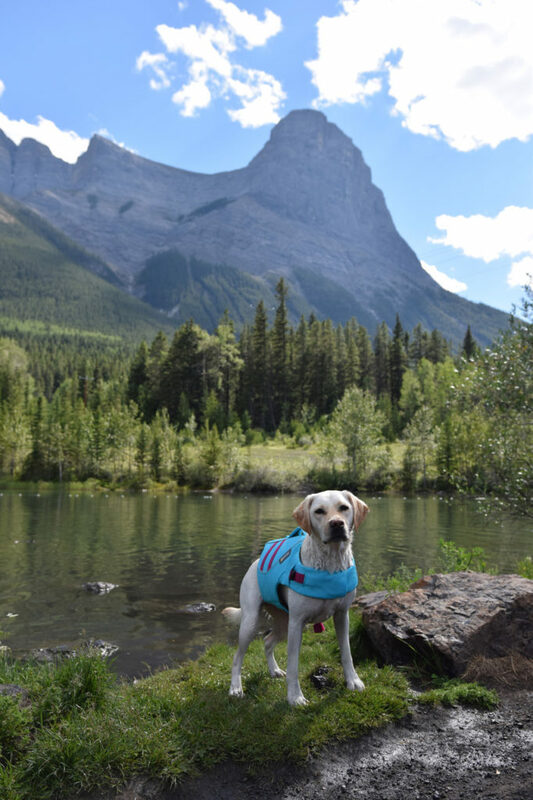 We will be using this jacket on most of our water adventures, as Farley is able to swim for a fair amount of time before tiring and are confident that the handle is strong enough to lift her weight without issue. If we were to enter glacier water, I would likely choose a life jacket that has more flotation on her hind end in case she were to completely stop swimming. Overall, the Float Coat is adequate for most everyday water adventures.